A man has been sectioned under the Mental Health Act after attending a hospital covered in white powder and subjected to decontamination procedure. The 49-year-old was detained shortly after being assessed by medical staff and specialist fire officers at Walsall Manor Hospital on Sunday afternoon. The hospital was not evacuated and police said there was no "serious health risk" to the public. Police added investigations were under way to identify the substance. In a statement released on Sunday, Walsall Healthcare NHS Trust said the hospital remained open throughout the incident. 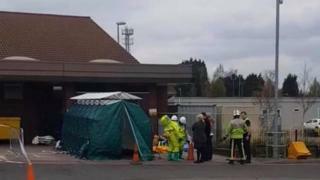 It said the man was "isolated according to the correct decontamination procedures" and did not come into contact with other patients. The fire service said on Sunday the matter was being treated as a "domestic-related incident".